Grafton is a town in Worcester County, Massachusetts, United States. The population was 17,765 at the 2010 census, in nearly 5,700 households. Incorporated in 1735, Grafton is the home of a Nipmuc village known as Hassanamisco Reservation, the Willard House and Clock Museum, Community Harvest Project, and the Tufts University Cummings School of Veterinary Medicine. Grafton consists of the North Grafton, Grafton, and South Grafton geographic areas, each with a separate zip code. Grafton also operates the state's largest On-Call Fire Department, with 74 members. Bands of the Nipmuc tribe were the indigenous inhabitants, and maintain a state-recognized reservation known as Hassanamessit, or Hassanamisco, which was formerly a Praying Indian village. 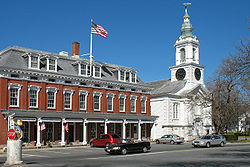 Grafton was first settled by Europeans in 1647 and was officially incorporated in 1735. Grafton has been a significant contributor in the success and progress of the American Industrial Revolution that was started in 1793 by Samuel Slater with his cotton mill in Pawtucket [Rhode Island]. North Grafton's Upper Mill, now known as the Washington Mills complex, that still produces abrasives, was once known as the New England Manufacturing Company. This was part of the New England Village, as North Grafton was known for generations. This part of the mill was built in 1826 and was part of a much larger complex, but most of that is now gone, mainly due to serious fires. Mill housing was built at 12, 14 and 16 Overlook Street. These central-chimney-style homes were boarding houses with ornate trim that has since been lost. The town is named for Charles FitzRoy, 2nd Duke of Grafton, a title created for the illegitimate son of King Charles II of England. Ethan Allen ran a gun factory in Grafton in the early 19th century. In the 1930s, a movie, Ah, Wilderness!, was filmed in the town. The moviemakers built a bandstand on the town common, which still stands there today. Grafton Common has many historic homes, churches and buildings and is considered the most quintessential common in the Blackstone Valley. The town is part of the Blackstone River Valley National Heritage Corridor, the oldest industrialized region in the U.S.
North Grafton is the home of the Wyman Gordon Company. In 1955, the United States Air Force installed a 50,000-ton metal forge in North Grafton as part of its Heavy Press Program in a plant operated by Wyman Gordon. It was the largest metal forge, and indeed the largest machine, in the world at the time it was built. This forge is used to form strategic metals used in commercial and military aircraft for turbine disks, shafts, and blades, landing struts and other aircraft parts where light weight and extreme strength are needed. The entire undercarriage of the space shuttles were forged in Grafton of magnesium. From 1901 to 1973, North Grafton was home to the Grafton State Hospital. Originally an offshoot of the Worcester State Hospital, Grafton State Hospital served as a "farm colony" where chronically insane patients could live and work in somewhat normal surroundings. The campus was made up of several clusters of buildings and eventually encompassed 1,200 acres (490 ha) in Grafton, Shrewsbury, and Westborough. The hospital was closed in 1973, and the campus, including many of the original buildings, was taken over by the Cummings School of Veterinary Medicine (part of Tufts University) and the Grafton Job Corps center. According to the United States Census Bureau, the town has a total area of 23.3 square miles (60 km2), of which 22.7 square miles (59 km2) is land and 0.5 square miles (1.3 km2), or 2.28%, is water. Grafton is located 30 miles (48 km) west of Boston and 5 miles (8.0 km) southeast of Worcester. By the 2010 census, the population had reached 17,765. As of the census of 2000, there had been 14,894 people, 5,694 households, and 3,951 families residing in the town. The population density was 655.0 inhabitants per square mile (252.9 /km2). There were 5,828 housing units at an average density of 256.3 per square mile (99.0 /km2). The racial makeup of the town was 95.92% White, 1.25% African American, 0.11% Native American, 1.45% Asian, 0.24% from other races, and 1.03% from two or more races. Hispanic or Latino residents of any race composed 1.91% of the population. Commuter rail service from Boston's South Station is provided by the MBTA with the Grafton station on its Framingham/Worcester Line. The Grafton and Upton Railroad currently operates a freight line through the town connecting the Framingham/Worcester Line to the Franklin Line in Milford. Also, the Worcester Regional Transit Authority has started a shuttle through the town connecting residents to different parts of the town and the Grafton Commuter Rail Station. This shuttle is also connected to the shuttle in one of the neighboring towns, Northbridge. The Grafton Free Public Library opened in 1867. The current building was built in 1927 with money donated by Jerome Wheelock, a local inventor. In fiscal year 2008, the town of Grafton spent 1.33% ($482,226) of its budget on its public library—some $27 per person. Steve Spagnuolo, former head coach of the St. Louis Rams, currently the defensive coordinator for the New Orleans Saints. ^ "Martin Issues Final Determination". Archived from the original on 2006-09-29. http://web.archive.org/web/20060929073126/http://www.doi.gov/news/nipmuc.html. ^ "New England Village/Walking Tours". Blackstone Daily.com. http://www.blackstonedaily.com/Outdoors&Nature/WTnevillage.htm. Retrieved 2007-12-11. ^ Gannett, Henry (1905). The Origin of Certain Place Names in the United States. Govt. Print. Off.. pp. 140. http://books.google.com/books?id=9V1IAAAAMAAJ&pg=PA140#v=onepage&q&f=false. ^ "Profile for Grafton, Massachusetts". ePodunk. http://www.epodunk.com/cgi-bin/genInfo.php?locIndex=2957. Retrieved 2010-04-24. ^ Schuleit, Anna. "Grafton State Hospital". http://www.youtube.com/watch?v=vNlMwK-HyRw. Retrieved 27 February 2011. ^ Dempsey, James (March 4, 1992). "Many Changes Since Tupper Started Ware". Worcester Telegram and Gazette. http://freepages.history.rootsweb.ancestry.com/~history/grafton/TupperwareNewsclippings.html. Retrieved August 11, 2011. This page uses content from the English language Wikipedia. The original content was at Grafton, Massachusetts. The list of authors can be seen in the page history. As with this Familypedia wiki, the content of Wikipedia is available under the Creative Commons License.